Among working women in India, an estimated 93% have casual jobs with many working in their homes – which are often hot, dark and stuffy. This impacts badly on productivity and can lead to poor health. This project provides women with simple adaptations which bring a lot of light and air into their homes. Changes to the home, including fitting dormer windows and energy efficient lighting and stoves, have vastly improved conditions in over 18,000 households across seven states in India. These simple adaptations are made available through affordable loans. Because natural light and air flow increases, the need for electric lighting and fans is significantly reduced. This leads to reduced living costs and increased productivity, meaning people can pay back the loan they took out to pay for the adaptations with the savings they make. For many poorer women living in informal settlements in India, the home is not just a place to live but also a place of work. Homes in Indian informal settlements are deep, long and arranged in rows backing onto each other. This means that there is no natural light or ventilation from three sides. Even in the middle of the day the rear part of the house remains dark and gets very hot. Most people solve this problem with electric lights and fans. However the electricity is expensive and electrical appliances generate their own heat. 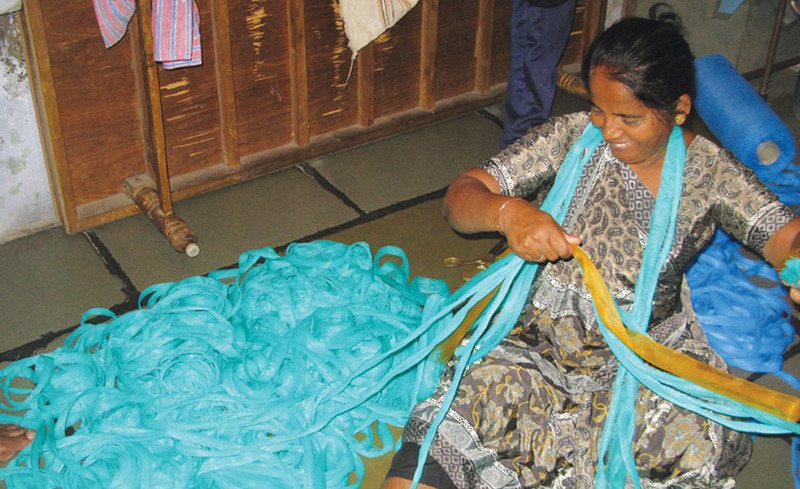 This problem is recognised by the Mahila Housing Trust, a non-governmental organisation which is part of the Self Employed Women’s Association; a movement which itself emerged out of the Textile Labour Association, a trade union established by Mahatma Ghandi in 1918. The Mahila Housing Trust work to mobilise its members. The Trust supports communities to organise, working at grass-roots level and supporting dialogue to influence government policies. Their goal is to make homes and the wider living environment more suitable for women to live and work in. This includes projects to upgrade water and sanitation, build roads, develop low-income housing and improve security of land tenure. The organisation works in rural and urban areas across India, Nepal and Bangladesh focussing particularly on areas where there is little other support from government or NGOs. 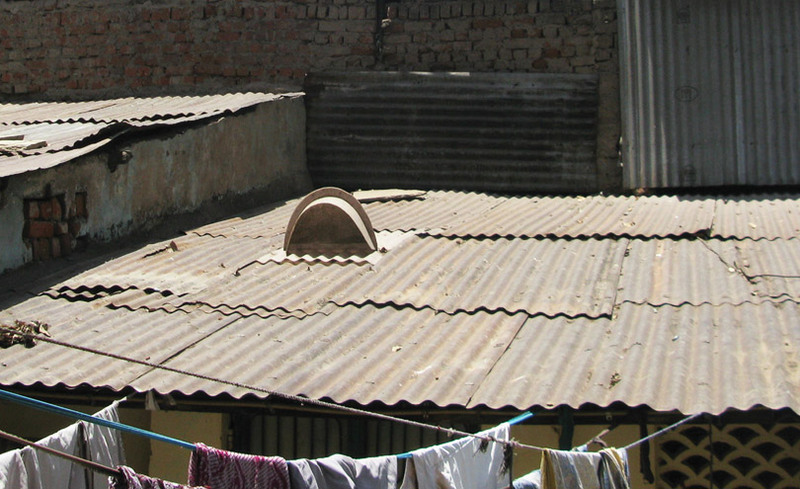 “Ujasiyu”, an innovation developed by the Mahila Housing Trust to improve working conditions for self-employed women in India, is a simple dormer window that can be fitted to the roof allowing natural light and ventilation into homes in informal settlements. The window is made of fibreglass and is moulded to fit onto the shape of corrugated steel, which almost all roofs are made out of. The window itself is made of translucent plastic. This prevents glare and diffuses the light so that it illuminates the whole room rather than creating a shaft of light. The plastic is moulded into a hump with an opening at the bottom to allow air to circulate. The gap is covered with gauze to prevent insects and other animals from getting in. Residents buy the dormer window (Ujasiyu) with the help of low cost loans which are offered by both the Mahila Housing Trust and SEWA Bank (cooperative bank that specialises in providing affordable finance to low-income self-employed women). Many families are able to pay back the loans within a year, through their earnings and the energy savings they make by having the window. Interventions were introduced in the state of Gujarat (West India) and are being implemented at various scales across the country in the states of Karnataka, Madhya Pradesh, Odisha, Jharkhand, Delhi and Rajasthan. In this project the housing trust partnered with Yatin Pandya, an Indian architect who runs Footprints E.A.R.T.H – an architecture and environment consultancy company. He offered technical support in the project development. The Solar Energy and Light Company (SELCO), an Indian social enterprise working on solar power solutions also offered technical support and sector knowledge. Ujasiyu focuses on vulnerable households where women both live and work as part of the informal economy. The women who benefit from the improvements carry out unskilled work such as embroidery and rolling bidis (a type of cigarette). Improved lighting and ventilation means that they can comfortably use the home for this work (increasing their productivity) as well as for leisure time. Children can also spend more time in the house doing schoolwork due to the increased light. Better ventilation and less smoke also helps to improve health issues such as breathing problems and asthma. Cost savings are made as less electricity is used due to increased natural light. The project has a community-led component with households helping to implement the new products and provide feedback for future improvements. Awareness of energy efficiency and the benefits of ventilated homes has increased as beneficiaries share their experiences with the wider community. As part of the wider work of Mahila Housing Trust, Ujasiyu is promoted to residents alongside other solutions which reduce energy use, including energy efficient light fittings and cooking stoves. 635 households to improve ventilation by installing Ujasiyu dormer windows. 18,050 households to reduce lighting costs by installing energy efficient light fittings. 2,647 households to improve cooking facilities with energy efficient cooking stoves. The main aim of the project is to provide natural daylight and ventilation in dark and dingy houses throughout informal settlements in urban India using community-led design. Ensure community conversations and voices contribute to the design of adaptations. Design, manufacture and fit dormer windows (selected by communities as the most effective option) for lighting and ventilation. Empower households in informal settlements to access loans that they can afford. Educate residents in informal settlements about energy efficiency and home improvements. A longer-term aim of the programme is to transfer the project to more communities across India so that more households can benefit from the interventions. Women make up 28% of the labour force in India. Among working women, an estimated 93% are in informal employment, earning a living through their own labour or small businesses. The nature of their employment makes it difficult for them to access ‘official’ state support, and financial services like credit and pensions. The Self-Employed Women’s Association was formed as a Trade Union, gaining recognition from the government in 1972. Since it began, the association has developed as a movement to improve the lives of its members through joining together to fight for things like workers protection, fair pay, and to develop solutions to improve living standards. The Self-Employed Women’s Association spread into a wide range of sister organisations to achieve its objectives. These include the SEWA Bank, a cooperative bank which uses contributions from its members to offer credit to self-employed women; and the Mahila Housing Trust, founded to improve housing and living conditions for poor women in informal employment. These two organisations are lead partners in Ujasiyu on community involvement. The need for interventions in informal settlements results from the rapid population growth experienced in cities across India. 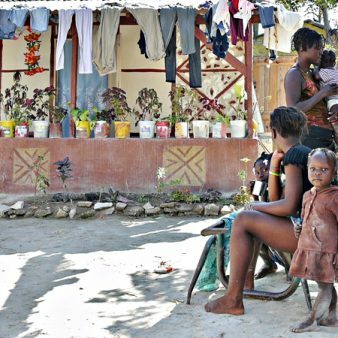 Most have struggled to keep up with this growth, and much of the population lacks access to basic infrastructure like housing, transportation and services. 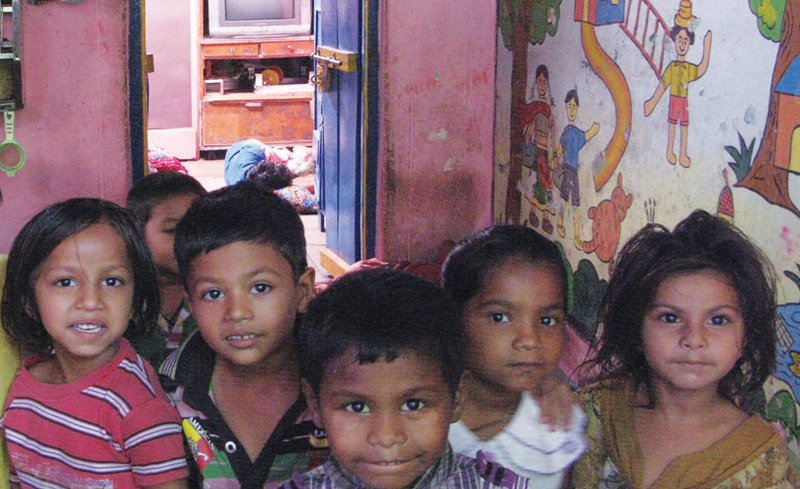 Nearly half the population in urban India are accommodated in informal settlements. Homes are densely packed, often very small, and built with temporary materials. A lack of natural light and air makes houses dark, dingy and stiflingly hot. This affects residents’ mental and physical health, as well as their ability to carry out day to day tasks in the home. Even in broad daylight many families are forced to use artificial lighting, and poor ventilation means fans are needed leading to high electricity bills. These issues are particularly negative for women who are more likely than men to be in the home during the day. Ujasiyu was developed in an ‘Innovation Centre for the Poor’, an initiative by Mahila Housing Trust and SEWA Bank to find simple interventions to improve the quality of life in the communities where their members live and work. Ujasiyu was developed in an Innovation Centre for the Poor, where prototype adaptations to improve lighting and ventilation were tested and selected by the community. Raising the roof sheet: allowing roofing to be raised to let air into the building. Sliding Window: Cutting the roof around 60cm and introducing a sliding window for ventilation. Dormer Window: Adding a Dormer window of around 30cm to 60cm height, by cutting a small part of the roof. Waste Plastic Bottle Insert: Cutting the roof equal to the diameter of the waste plastic bottle. On inserting the bottle, the sun light illuminates through plastic thereby lighting the interior spaces. After the success of the Dormer window adaptation based on volunteer feedback this was chosen to be rolled out at scale. In the pilot stage, these were provided free of charge and electricity savings were monitored for three months to understand the savings. The main motivation behind Ujasiyu is to make homes comfortable spaces where women can carry out informal home-based work more easily. For women in informal settlements this is essential so that they can support their family and gain some financial independence in the home. A more comfortable working environment is not only healthier and more comfortable it also increases productivity. Along with savings in electricity this increases people’s income. It also benefits the family more widely in that children can study in the home improving educational success. A wider culture of energy savings and home improvement has been developed through the work of the project to engage with the local community in discussions about the possibility of improving homes and participating directly. Mahila Housing Trust – Initial partner in setting up the project (with SEWA Bank). Worked with communities to develop dormer window product. Also provides some small loans. Firstly, the project ensures that families live in healthier homes with access to natural light and air, improving both physical and mental health. In addition to healthier homes it has enabled families to save between 30-50% on their energy bills through having to use lights less often in daytime hours. These cost savings allow families to spend money on other needs such as education, as well as to accumulate savings and pensions. The new healthier homes have allowed many women who work from home to improve the effectiveness of their businesses and increase their income. The adaptations have also created better study environments for children in the home. Ujasiyu also has a positive environmental impact in the use of less energy. Ujasiyu as a product is still developing and adapting. The dormer window is currently installed in 635 homes and work is underway to address the challenges of differences between building types. 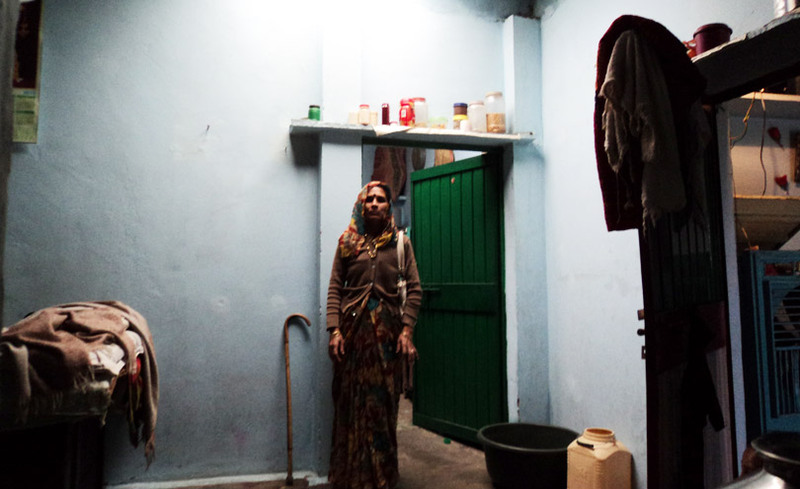 The wider work of the Mahila Housing Trust to promote energy saving has enabled over 17,000 households across informal settlements in seven states to benefit from one or more interventions (the total number of installations stands at 21,332). 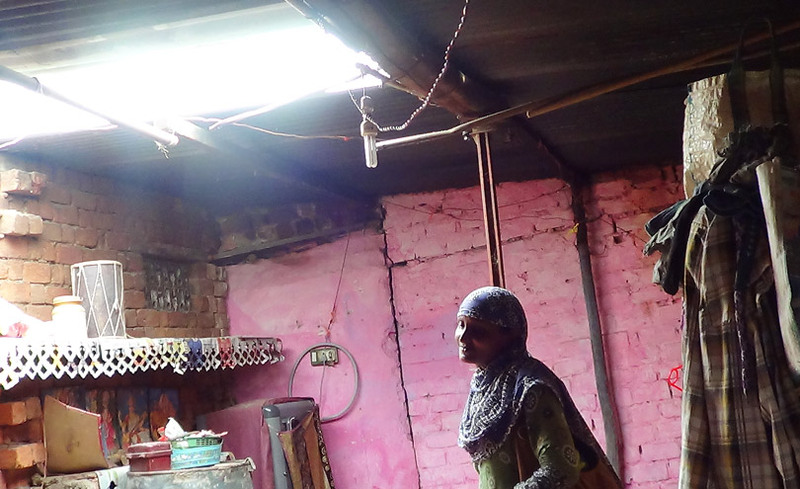 With a range of options and affordable credit, households can choose to install a single intervention even if they cannot afford to have all three (cooking, lighting and ventilation) at the same time. Currently about 20 per cent of families have been able to benefit from more than one installation. The project is working on reducing the costs of Ujasiyu further so that the product can be accessed by an even greater number of households. Although the project has not directly impacted any policy changes it has changed the attitudes of residents enabling them to take ownership of their right to a comfortable home. It has also increased community awareness and education on energy saving and the use of simple interventions to create healthier homes. Initial set up costs were covered by international donor funding. Mahila Housing Trust worked with SEWA Bank to develop relationships with beneficiaries. This included setting up the ‘Innovation Centre for the poor’ where the project was planned and social surveys were carried out to understand people’s needs. Some fundraising was done to increase the funds available for start-up. In addition, initial design and technical support were offered for free by the architect Yatin Pandya through his practice, Footprints E.A.R.T.H. Once a family becomes involved in the project it is up to them to fund the housing improvements. They can do this through taking out loans from the SEWA Bank. The ventilation units cost each family 5,000 Rupees (approximately US$80). Instalments and interest are kept affordable in line with the bank’s cooperative principles. The fact that improvements ensure 30-50% savings in electricity bills per month means that families can make savings into the cooperative bank and pay off loans quickly, often within a year. The ventilation units are produced locally to minimise costs. They are now sold under a private company called MHT Awaas SEWA Private Limited which was registered by the Mahila Housing Trust in 2013. The project is innovative in three ways: the product itself, the way in which it was developed and the focus on women. The dormer window is the key innovation of this project. 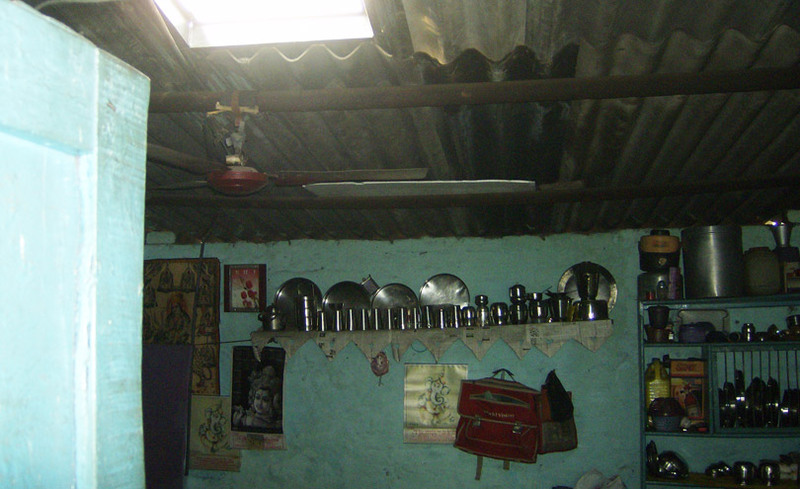 Although there are other projects (notably the 2015 World Habitat Award winner – Liter of Light) that solve the problem of poorly lit houses in informal settlements, the dormer window in this project is specifically designed for the needs of homes in India and provides ventilation as well as light. The project’s home improvements were developed through a community-led ‘innovation centre’. The project did not begin until conversations with residents were undertaken so that their needs could be fully understood. Other approaches may focus on moving people from inadequate housing in informal settlements, instead of trying to ensure houses are more liveable in their community. The Ujasiyu product allows people to remain in their community, making it a more sensitive design innovation. The focus on women in informal settlements is another innovative factor. Providing improvements to homes, the main workplace for many women, empowers them to earn increased incomes. Because conditions in their homes are improved and comfort is increased throughout the day and night, women are also given more control over the type and amount of work they do. The focus on women in informal employment, within informal settlements is also innovative. 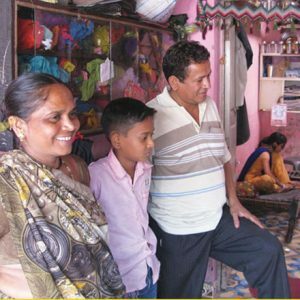 The collaboration with SEWA Bank means that the families can access affordable credit and not become burdened with debts from unregulated moneylenders, or be left out of the lending system all together because of lack of collateral. The project works to improve current homes rather than building new ones, which saves energy and material use through the construction of new buildings. The project reduces the amount of energy used in homes and therefore their environmental impact. Specific adaptations had specific environmental impacts. Residents who have had the dormer window installed have reported energy savings of up to 50%. The use of locally available materials for adaptations also reduces the carbon footprint of the project. Initially adaptations (improvements to cooking, lighting and ventilation) were subsidised through grants. Once the effectiveness of the interventions was more widely known and understood, the project developed into a social enterprise. Families who want to install one or more adaptations are expected to raise their own funding. Soft loans are provided to interested households by the SEWA Bank. Costs are payable in instalments and are repaid within a year. The savings made on energy bills generate enough savings to cover the repayments. After repayment, the benefits to households will continue for the long term, enabling them to improve their income and standard of living. Despite the potential savings, the cost of loan instalments has limited some of the poorest families from being able to access Ujasiyu products. Work is underway to lower costs so that the approach can be offered to a wider range of households. The work of Mahila Housing Trust empowers women to be able to fulfil their right to a comfortable and healthy home. Their involvement in the project’s development and the ongoing discussions which occur once the improvements are in place mean women are partners not just voiceless beneficiaries. The Ujasiyu dormer window improves the air quality in the homes which are cooler and no longer smoke filled (smoke can leave through the ventilation dormer) and are naturally lit. This reduces negative health impacts such as breathing problems, and improves mental health as people live in less dingy spaces. Entire families are able to spend more time inside on both work and leisure. For women who work in the home, better light, ventilation and reduced smoke from cooking stoves has improved productivity and increased income. Families who have benefitted from Ujasiyu have more disposable income to save, and pay for things like children’s education. The main challenge so far has been that differences in local construction and local bylaws meant each city and state needed different size sheets to go with the dormer window installation. For example, in the city of Surat in Gujarat, homes needed much larger sheets. These needed to be developed cost effectively to maintain the affordability for the families in need. In some homes, a waste bottle roofing solution was implemented where a plastic bottle was fitted into the roof which the sun would shine onto and illuminate the inside rooms. This was less effective than the dormer window but was used where it was not possible to install dormers. In some states, production and application has slowed down due to increasing manufacturing costs. This should be overcome if the project develops its own manufacturing centre. A further challenge has been promoting the improvements and convincing residents that they work, so they are happy to take out the loans to pay for the solutions. Residents were also not used to their opinions being sought in projects like this. The project is currently being promoted by word of mouth and through communication between the project implementers and the local population. As the project was implemented in states which differ in their physical context, ventilation adaptations had to be redesigned to suit the local context. Finding local manufacturers who could produce products in a cost-effective manner is an issue in some locations. To overcome this, the project aims to set up local manufacturing centres. This new expansion is still at initial planning stage. The Ujasiyu project also hopes to diversify the products they offer to provide a wider range of practical solutions to improve ventilation and natural lighting. The project has not been formally evaluated yet anecdotally the product has been seen as a positive innovation amongst beneficiaries. The project has hosted various international visitors including representatives from Bill & Melinda Gates Foundation, Misereor Foundation, Care Foundation (Dhaka), Millennium Alliance along with FICCI, Womanity Foundation and the Rockefeller Foundation. 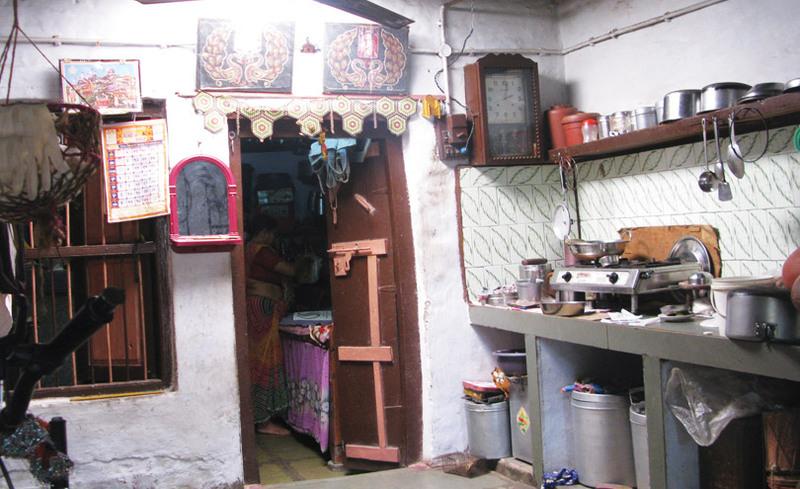 The Mahila Housing Trust’s work to improve working conditions in the home through reduced energy costs has scaled up from impacting 140 houses at the pilot stage to now 21,332 lighting, cooking, and ventilation installations in 7 states of India: Gujarat, Delhi, Madhya Pradesh, Karnataka, Odisha, Rajasthan and Jharkhand. Work on transferring and scaling up the Ujasiyu dormer window product is continuing, and has also inspired further work led by the Mahila Housing Trust to produce modular roofing made out of paper waste and coconut husk for informal settlements. In 2016 this innovation won the ‘Urban Labs Innovation Challenge: Delhi’ an award organised by the University of Chicago and the Delhi Government in response to its success in bringing down indoor temperatures improving living conditions. The project has so far been implemented at a pilot stage in three informal settlements in Delhi around new sustainable innovations such as solar powered lights and solar eco-cooler. Paliben Jayantibhai Pattni lives with her family of six in Ahmedabad. She works at home stitching clothing. It used to be very difficult to work at home. To do stitching jobs I had to use tube lighting even during the daytime. The electricity bill was very expensive. Now with improved natural light and ventilation, I can do most of my work without having to use tube lighting. I can work in a more comfortable environment. My income has increased and I have been able to save money in my pension and savings account.